We brought together our passion for travelling and making friends from all over the world, to design Kospi Boutique Guesthouse. It is our number one priority to welcome our guests with warm, personalized and excellent service! 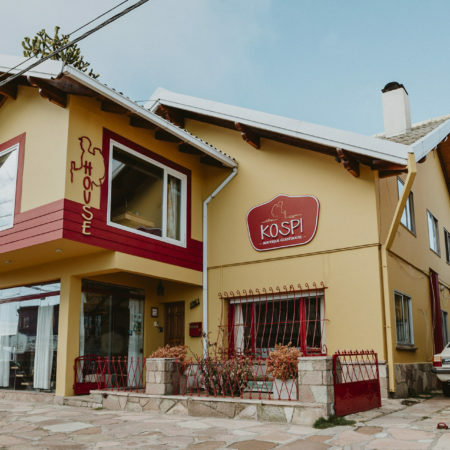 Home away from home, Kospi is the perfect place where you can rest and enjoy every bit of Bariloche! Our Guesthouse has 11 rooms with private bathroom. Beautiful designs around the house invite you to relax and enjoy a peaceful rest. There are common areas where you can meet other travellers, read a good book or enjoy a great coffee. And for those passionate about food, the charm of a large, well-equipped kitchen, where you can treat yourself with a beautiful homemade meal. A modern style and a retro vibe well combined, make every corner of the house tell its own story. Come live your own experience! We would like to share with you the Legend of Kospi. Kospi was a Tehuelche princess who lived in the Andean-Patagonian forests. Legend has it that the Thunder god, in love with the princess´s beauty, abducts her and takes her to the top of the Andes, leaving her where only he could reach her. Sadly, the princess froze by the cold of winter and became part of the glacier. When the god returned looking for her, he could not find her and furiously unleashes a storm. The heavy rains caused the glaciers and snow to melt, taking Kospi’s essence along the slopes and rivers to every corner of Patagonia. These waters penetrated the earth, they clung to the roots of every plant they found in their path and climbing their stems gave life to the first flowers of the universe in their own cosmovision. This is why the Tehuelches word “Kospi” translates to petals of flowers. And it is because we feel identified with the places in which the story takes place and in honor of the first natives of our lands, that we decided to name Kospi our little Boutique Guesthouse.